Great dietary diversity exists among the 550 living crayfish species. As a group, they consume sedentary food such as algae, aquatic plants and detritus, as well as highly mobile invertebrates and small fish. Additionally, crayfish are important prey species; scientists have identified more than 200 predators of crayfish in North America. Occupying this important part in many ecosystems, scientists consider them “keystone” species, which are crucial for species occupying tropic levels above and below them. Resembling tiny lobsters, crayfish are freshwater crustaceans with flipper-like tails, long antennae, eight walking legs and two large pincers. Though they are not especially gifted swimmers, they can propel themselves backward by contracting their tail quickly. Crayfish spend most of their time in burrows dug under submerged rocks and logs, though a few species are semi-terrestrial, and dig burrows in moist soil. Young crayfish stay near their mother for some time after hatching. While most species live less than five years, some may exceed 20 years of age. Though the details vary from one species to the next, crayfish are important predators of aquatic plants and algae. While humans sometimes introduce crayfish to foreign lands with disastrous environmental consequences because they are so effective at eating vegetation, scientists have considered the possibility that crayfish may be powerful agents for controlling unwanted aquatic vegetation. Few aquatic plants grow in streams and rivers; however, crayfish consume the leaves, bark and twigs that fall in the water from overhanging trees. While animal-based food is an important component in the diet of adult crayfish, it is even more important for the fast-growing juveniles. Young crayfish consume about 1 to 4 percent of their body weight in food each day, while adults generally eat less than 1 percent of their body weight. Crayfish use their large pincers to capture common prey items, such as worms, leaches, snails. Additionally, crayfish occasionally capture large prey, such as frogs, fish, salamanders and tadpoles. Frog eggs and insects are important foods for the juveniles of many species. Crayfish are important scavengers of freshwater streams and ponds. 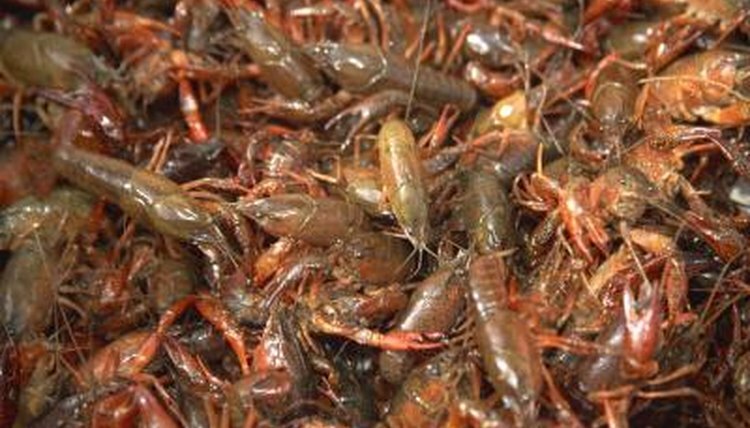 Crayfish prefer to crawl near the bottom of lakes or on submerged structures like logs or rocks; accordingly, they do not often feed on floating carcasses. However, when dead animals sink to the bottom, or become stuck to the shore or submerged logs, crayfish eagerly consume the dead animal. Dead fish, amphibians and invertebrates are the type of carrion usually encountered in crayfish habitats, but birds, mammals and reptiles occasionally fall into the water as well. Evidence of their scavenging nature is found in one of the most effective baits for crayfish: meat scraps from human dinner tables. Penn State University: Species Page: Cambarus Sp. What Is the Difference Between Walking Legs and Chelipeds in Crayfish? What Type of Fish Eat Shrimp? What Are Some Predators of Crustaceans?